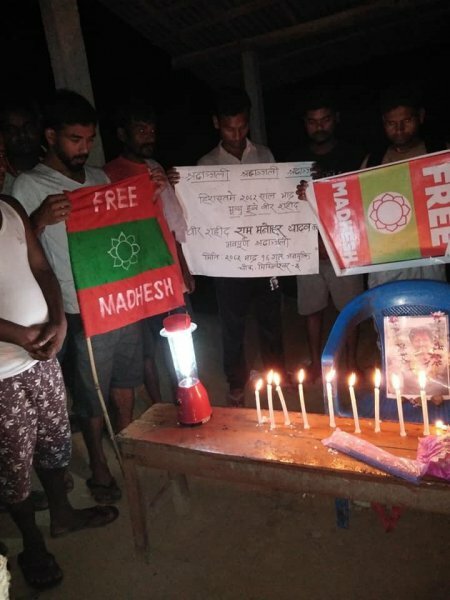 In September 2018, Free Madhesh activist Ram Manohar Yadav reportedly died while in Nepali police custody under suspicious circumstances. The police have claimed his death occurred at a local hospital in Kathmandu instead and are refusing to open an investigation into the matter despite his family’s repeated attempts to lodge a First Information Report (FIR) to start a case. Meanwhile, the Kathmandu police has autopsied Yadav’s body without his family’s consent. Police in Kathmandu sent the body of Ram Manohar Yadav for autopsy without seeking consent from the family, according to his brother Bishnu Yadav. A Free Madhes activist, Ram Manohar had allegedly died in police custody earlier this month. However, both police and the government have been insisting that he had died while undergoing treatment at the Tribhuvan University Teaching Hospital in Kathmandu on September 2. They also maintain that the post-mortem was performed on September 7 with family approval. Bishnu, however, told the Post that he was informed about the post-mortem only after he received a call from the District Police Office, Bardiya, on Saturday. “They told us that the post-mortem had been carried out and called us to receive the body,” he said. Ram Manohar’s body remains at the Teaching Hospital morgue. His family has refused to receive his body, demanding that they should be allowed to register an FIR to open an investigation into the death. “Police in Kathmandu denied to register our FIR and suggested that we go to the district. So, I returned home,” Bishnu said, adding that police in Bardiya and Banke districts refused to register FIR. The non-consented post-mortem of Ram Manohar was reportedly performed the day after Bishnu returned to Bardiya. Bishnu said he had received a phone call on September 22, and two police personnel were also sent to his village to ask the family to receive the body. DSP Phanindra Prasai of the Maharajgunj Police Circle confirmed that the autopsy was conducted on September 7. “In some cases, we have to perform the post-mortem immediately, belaying a delay it could erase evidence as the body starts decomposing,” he said. Home Minister Ram Bahadur Thapa has claimed that Ram Manohar’s autopsy was carried out with the consent of his family. “The government had approached Ram Manohar’s family for the post-mortem soon after his death. As they didn’t let us do so, it couldn’t happen for sometimes. Once the family members agreed, then only the post-mortem was conducted,” he said in response to lawmakers’ concerns over the custodial death and unapproved autopsy of Ram Manohar on Monday. Home Minister Thapa also told the Upper House that Ram Manohar was airlifted to Kathmandu from Nepalgunj when in fact he had been transported in an ambulance. Ram Manohar was detained on August 23, along with three other Free Madhes campaigners--Harpal Singh, Irfan Sheikh, and Ranjit Ram Verma-- for waving black flags at Deputy Prime Minister and Health Minister Upendra Yadav in Gulariya, Bardiya. While the reason behind Ram Manohar’s death remains unclear, the autopsy report has been sent to the Bardiya District Police. Family members have been claiming that he died on the way to Kathmandu after he was tortured by police. The National Human Rights Commission is also investigating into the alleged custody death of Ram Manohar. “The investigation could take some time to get to the truth,” said Mohna Ansari, the commission’s spokesperson. She added that the government should make its agencies responsible as Ram Manohar had died in police custody and the government should find out what really happened instead of trying to cover up the incident.